(Nanowerk News) Organic devices have greatly benefited from the remarkable advances in synthetic organic chemistry that have allowed for the synthesis of a wide variety of π-conjugated molecules with attractive electronic functions. In Chemistry – An Asian Journal, Wei-Shi Li, Takanori Fukushima, Takuzo Aida, and co-workers, based at the Shanghai Institute of Organic Chemistry (China), Riken (Saitama, Japan), and the Japan Science and Technology Agency (Tokyo) describe the rational design strategy using side-chain incompatibility of a covalently connected donor–acceptor (D–A) dyad to synthesize organic p/n heterojunctions with molecular-level precision ("Use of Side-Chain Incompatibility for Tailoring Long-Range p/n Heterojunctions: Photoconductive Nanofibers Formed by Self-Assembly of an Amphiphilic Donor-Acceptor Dyad Consisting of Oligothiophene and Perylenediimide"). Although organic devices can be easily designed, without proper molecular design that allows for long-range ordering of -conjugated molecules, the resulting devices will rarely show the expected performances. Thin-film organic photovoltaic devices require electron-donor (D) and -acceptor (A) molecules to assemble homotropically to form a heterojunction. Additionally, to achieve a highly efficient photoinduced charge separation, the resultant p- and n-type semiconducting domains must be connected over a long distance. However, D and A components tend to assemble together by means of a charge-transfer (CT) interaction, unfavorable for photoelectric conversion. Oligothiophene (OT) and perylenediimide (PDI) have been synthesized to form covalently linked D–A dyads, which bear at their termini either incompatible or compatible side chains. 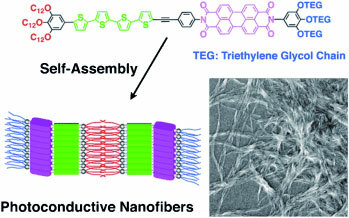 The dyads with the incompatible side chains intrinsically self-assemble into nanofibrous structures, whilst the dyad containing the compatible side chains resulted in ill-defined microfibers. Flash-photolysis time-resolved microwave conductivity measurements, in conjunction with transient absorption spectroscopy, clearly shows that the assembly with the incompatible side chains exhibits a much greater photoconducting output than that with compatible side chains. This design strategy with "side-chain incompatibility" provides promise for the realization of p/n heterojunctions from covalently connected D–A dyads. Furthermore, this design strategy can give rise to long-range structural integrity that is essential for excellent device performances. Aida writes "elaboration of side-chain-incompatible D–A dyads in terms of absorption range and carrier transport properties is a subject worthy of further investigations for developing molecularly engineered photovoltaic devices."